Hydratech specialise in the manufacture of heat transfer fluids, glycols, antifreeze solutions, inhibitors and cleansers - for use in cooling and heating systems across all sectors. Supported by a range of Fluid Management Services to maximise, monitor and maintain long-term thermal efficiency. 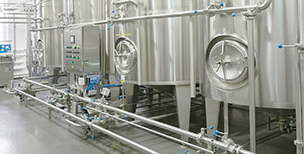 Cost effective milk and dairy processing benefit from energy efficient cooling. Coolflow process cooling fluids are industry proven to increase productivity, reduce maintenance and lower operating costs.